I can still remember the time when the products that my family was buying depended on what the local store has to offer. And the lack of choice can, and more often than not, is frustrating. My young self was, in a way, obligated to satisfy his needs with the limited options of the local market. And the food we can leave aside, but the notebooks that the kids from other neighborhoods were bringing to school, had way more interesting covers than those that the local bookshop was selling. And not only the notebooks, their pencils, and pens were different, their clothes even. But we still had to go in one school and share desks. The only solution that I saw as a kid was to ask where are those ‘magical stores’ with so much diversity. And back than Internet wasn’t what it is today, thus, probably even the elders were also asking the exact same question, once they see something that interests them. This is what the Internet does to the businesses. It makes them findable. And even if no one knows that you exist, a person that is living in another neighborhood or city, can stumble upon your website and buy from you. And he won’t have to ask anyone around himself to do so…no one, but Google. You can see where this is going, you need a website. But let me point out a few reasons that will perhaps make you consider creating a website for your business and thus, make it (more) successful. I think this point was very clearly made in the introduction. Yet, it is something that deserves to be noted by itself. Once your business is online, people from all over the world will be able to find it. The more people land on your website the more business you’ll have. No matter how much I twist and tweak it, I am unable to think of a situation where more business is not a good thing. Of course, being unable to deliver your products internationally, could be an inconvenience. On the other hand, your website’s language and supposed SEO, and other marketing efforts will help you overcome a large amount of ‘unwanted traffic’. If you don’t deliver your goods to other cities of your own country, maybe it is time to reconsider that option. Once you build your website and market it right, people will order from you. And except you are not selling exclusively to the citizens of a specific city, there is no reason not sell to everyone interested. Lately, I’m mesmerized by the idea of the Long Tail. I was, of course, acquainted with the idea from the Chris Anderson’s book with the same name. The long tail is, in fact, a term used in statistics and business. But let’s not get too technical. 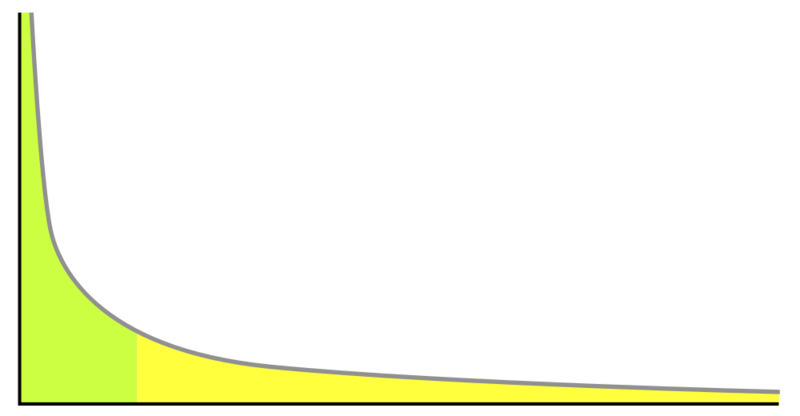 The easiest way to understand the idea of the long tail is to imagine the scale of popularity of people, songs, movies, books, or anything else. As you can imagine, when speaking of popularity there is always someone at the top. A person or group of people that seem to take over all of the available screen time, and newspaper pages. Sometimes it seems that everyone is talking and thinking only of those people. But this is hardly the case. There are way too many people on the earth. And it is absolutely impossible for every single one of them to be fascinated by the personality of the same exact celebrity. Also, every group of people and every sub-culture have their own social stars. And they are more interesting to that group than the mainstream superstars. This comes to show that your business will have sales if the product is decent enough. If you are selling something extraordinary, there is a possibility for your product to become a ‘superstar’. If not, you can take advantage of the long tail, and make sure that no matter how many (depends on a number of factors), there will be sales. Although a sporadical sale to a person that is not part of your local community is still considered a long tail(but in other sense), for you to be able to ‘get in the long tail’, a website is a must. Building a website was and still is an expensive initiative. And if tell you that you can create a business website free of charge, you probably would be skeptical about it. And for a good reason. Since we were kids, the elders were repeating to us that there is no such thing as a free meal. But there is a difference between paying with money and paying with time. And if you are eager to dedicate your time, you can create a business website for free. The first thing you’ll need to build a website is Free Hosting. And after that, you can proceed to install WordPress or another CMS according to your preferences. And by using an open source CMS and our hosting services, you easily build a business website for free. Using a CMS makes it easier for everyone to build their website. And although at first the number of options of the CMS’s may confuse you, once you get to know them, you’ll find out how easy it is to create a website. And yes, CMS’s do have some limitations, but except when you need a really custom solution for the website, they’ll do the work. And, honestly, it is foolish not to use a CMS, when trying to build a business website. Even the web-developers know that and usually use WordPress to build the websites of their clients. It saves so much time and effort. And by following our WordPress Tutorials, you can soon have a business website. For free. Marketing is a crucial part of business development. Before the across-the-board Internet growth, the conventional type of marketing was, in essence, the effort to reach as many people as possible with the goal to sell as much product as possible. Meanwhile, hoping for a good ROI. Today, the marketing efforts are more targeted, cheaper, and thus, more efficient. You can and preferably will target the group of people that are more likely to buy your products. If you are just converting from a brick-and-mortar(physical) shop to one based on bits(e-commerce), you’ll be able to target people who are more or less like the ones that are already buying from you. Of course, you have to have that knowledge. But even if you don’t, you can always install Google Analytics and use the information gathered from the tool, to get to know your customers. The only relevant reason not to build a website for your business could be the fact it costs money. On the other hand, as mentioned before, you can create a business website for free. And furthermore, the economy is taking such a turn that if you don’t exist online, you might as well not exist at all. It is yet another responsibility. I get that. But yet again, I believe that if you choose the path with the least resistance, you will soon face no resistance at all… mainly because your business will disappear with it. Free web hosting is a thing. Open-source(thus, free to use) CMS’s are a thing. If you feel confident enough in your skills to develop and market a website, you can go for our paid web hosting services. Start a website in less than 20 minutes!